Very plush high pile rug 30mm / 1.18in. 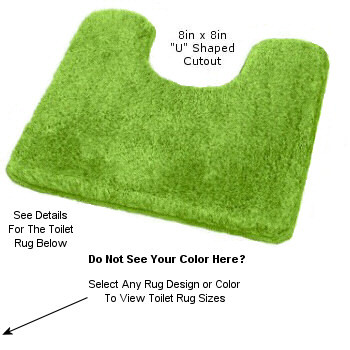 Made from long wearing and durable polyacrylic which has a soft wool like feel. The cutout is 8in x 8in at the widest points of the "u" shape. Polar White: Plush snow white color option. Champagne: Golden tone champagne beige. Azure Blue: Soft medium tone blue. Anthracite Grey: Unique deep grey tone with a blue cast making this a dark cool tone grey. A perfectly bold accent for your bathroom. Black: Deep dark beautiful black tone bath rug. Our elongated lid covers are a mingled color and coordinate with each rug swatch.